Do You Really Need a Dry Leak Detector? Over the past 20 years, there has been an increase in dry leak detector demand (mainly driven by semiconductor fabrication plants). The demand was spurred by the fear of oil back-streaming from leak detector models using oil-sealed rotary vane vacuum pumps. Fortunately, this fear has been quelled by modern vacuum pump technology. However, many buyers are still letting this old problem guide their decision making process when selecting a new leak detector. This can be a costly decision if the only reason for choosing the dry leak detector over the wet is oil back-streaming. Dry units can run 30% to 50% more in cost ($) than wet leak detector models. The latest vacuum pump technology eliminates possible oil back-streaming due to high compression hybrid turbo pumps found in modern leak detectors (such as with LACO’s new TitanTest™). The risk of oil contamination always exists for leak detectors when operating only in pure contraflow mode where the oil lubricated pump reaches its base pressure when connected directly to the inlet of the leak detector where the part to be tested is connected. At base pressure, the flow regime is no longer in viscous regime and oil migrates towards the inlet of the unit and oil vapor can condense inside the parts or inside the test chambers. However, new leak detectors like the TitanTest™ can go from Gross leak mode (contraflow) to Fine leak mode (side port turbopump) at 5 mbar. At that pressure, we are still in viscous regime, so no back-streaming takes place. In Fine leak test mode, the turbopump becomes a barrier for hydrocarbons and none of them can make it through. So when do you actually need a dry leak detector? Even though oil back-streaming is no longer an issue with new wet pump leak detectors, there are still applications which require dry units. If you are working in a contamination-free operating environment like a cleanroom or laboratory, then a dry leak detector would be the best choice to maintain cleanliness, and avoid contamination from potential oil misting given-off by the vacuum pump exhaust. Although, this can be avoided by connecting the leak detector to an exhaust vent line. Semiconductor fabs probably won’t be making the switch to wet leak detectors any time soon. When semiconductor wafer feature widths were far greater than about 10 µm, purity was not the issue that it is today since widths are now at 14 nm. Devices have become more integrated, and so cleanrooms have become even cleaner. Today, semiconductor fabs are pressurized with filtered air to remove even the smallest particles, which could come to rest on wafers and contribute to defects. Even the workers in semiconductor fabrication facilities are required to wear cleanroom suits to protect the devices from human contamination. An oil lubricated leak detector would not even be allowed to step foot inside one of these fabs as the smallest oil mist from the leak detector could contaminate an entire batch of wafers. In addition to semiconductor device manufacturing, any application with strict cleanliness requirements should use a dry leak detector in order to avoid process contamination. These applications might include: nanotechnology, pharmaceuticals, biotechnology, particle physics, laser optics, photovoltaics, and optoelectronics. 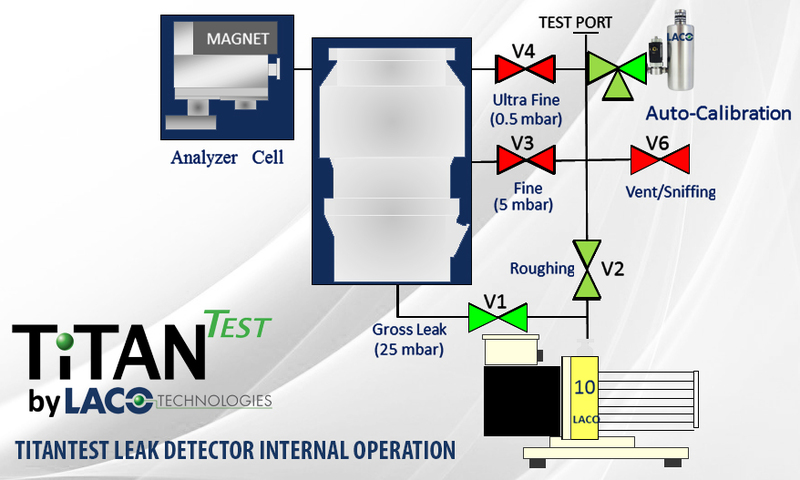 If you do not require an ultra-clean operating environment, then you can save yourself some cash by choosing a wet leak detector model for your leak testing application. The worry of oil back-streaming has been eliminated from oil lubricated leak detectors due to high compression hybrid turbopumps. So, unless you work under stringent cleanliness guidelines you can now purchase a wet pump without any fear!